The United Nations refugee agency has increased its funding appeal by $91 million to meet the humanitarian needs of Somali refugees in the region and the people displaced inside the Horn of Africa country. “We are seeking some $488 million to provide continued support to displaced Somalis in 2017,” said Andrej Mahecic, spokesperson of the Office of the UN High Commissioner for Refugees (UNHCR), at the regular bi-weekly press briefing in Geneva. The update includes an additional requirement of $91 million for Somali refugees in Ethiopia, Kenya, Yemen and those displaced inside Somalia, he added. “Insecurity, capacity of Government institutions, curtailed humanitarian access, limited livelihood opportunities, lack of basic services and poor infrastructure are some of the key challenges in Somalia,” added Mr. Mahecic, and the current risk of famine with reports of deaths and illnesses caused by drought-related factors is further complicating daily lives of Somalis. More than two million Somalis are currently displaced by conflict, which has lasted for more than two decades. Some 1.5 million people are internally displaced and nearly 900,000 have crossed the national borders to Kenya, Yemen, Ethiopia and Djibouti. The ongoing drought also increases risk of famine-induced displacement in the region. 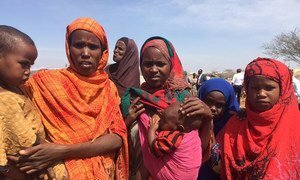 Since November 2016, more than 683,000 people in Somalia have been internally displaced by drought, including more than 377,000 displaced during the first quarter of 2017. UNHCR also needs resources to address return and reintegration of 50,000 returnees from Kenya and 10,000 from Yemen. Hearing the heart-wrenching stories of desperate families displaced in Somalia, United Nations Secretary-General António Guterres today urged a massive scale up in international support to avert a famine in the drought-striken Horn of Africa nation and curb the spread of cholera.